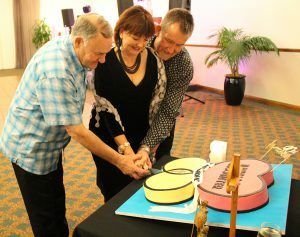 Fr Ron Bennett of Ōtari Parish and Neil and Francie Ivamy of Tararua, cut the anniversary cake. 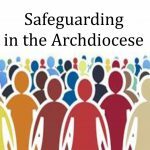 The Second Vatican Council stressed the role of all people in the life of the Church. The Worldwide Marriage Encounter Movement grew out of this. 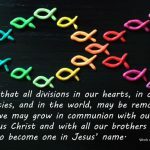 It began in the Wellington Archdiocese (now Wellington and Palmerston North dioceses) in June 1978. 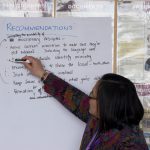 The programme teaches a way of communication, creating a closeness and daily growth. Forty years after its beginnings, 32 couples and four priests gathered in Palmerston North in August to celebrate. The oldest married couple were Margaret and Russel Haddock from Whanganui. The youngest couple were Kelly and Luana Durston from Napier. Special guests Eric and Ma Narayan came from Fiji. Frs Matthew Clerkin ofm Cap, Paul Kerridge, Ron Bennett, and Carl Telford sm celebrated Mass. Between them they have been associated with Marriage Encounter for about 145 years! At Mass, marriage and priestly vows were renewed. Dinner followed with the cutting of the cake and dancing. At Sunday Mass at the Cathedral of the Holy Spirit, Monsignor Brian Walsh thanked the Marriage Encounter Movement for all it has done in fostering the sacraments of marriage and priesthood. Couples and priests left knowing that Marriage Encounter in New Zealand is in good heart and looking forward to meeting again for the 50th Anniversary. The next Marriage Encounter weekend in Wellington is 9–11 November at the Home of Compassion, Island Bay. Phone 0800 362 686 or visit marriageencounter.org.nz to book or for more details.